Is a Polonaise not a Polonaise? 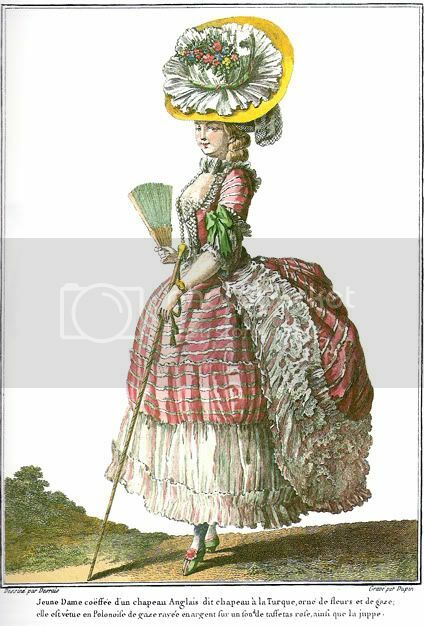 I've always called draped up skirts from the 18th C á la polonaise, and for simplicity if anyone would ask, I'd say that a polonaise was a draped up anglaise. I had assumed that the á la polonaise refered to the style of draping, but it seems I (along with the majority of the costuming community) might have been wrong. Sparked by a discussion brought up on the Historical Sewing Forum (which you should join if you're into the 18th C and haven't already) I dug around a little, and found some tidbits about what a polonaise actually might have been. Though this term is often applied to any 18th century dress with back drapery it belongs, strictly speaking, to an over dress that appeared c. 1775. This was cut like a man's coat of the same period, with centre back and two far-back side seams all terminating in inverted pleats, the front being in one piece with an underarm dart. It was caught to the top of the bodice centre front, and fell back into slight folds shewing a tight-fitting bodice or corsage, and the petticoat. The side seams of the skirts had tapes, or rings through which tapes could be threaded, to loop the material into puffs. Polonaise. A robe with skirt fronts pulled back to form three coattail sections which are held up by ties or drawstrings. It is worn over a matching or contrasting skirt having a flounce or deep border around the hem. Polonaise á deux fins i a gown with a skirt back made to be worn either draped up or released to hang in a train (thus, "two-purpose polonaise"). Robe á la Reine or á la polonaise. In fashion from 1776 to 1787, this robe consisted of a bodice with an attached overskirt whose fronts were pulled back to show the underskirt. Often the cords that drew up the overskirt were decorative and ended in rosettes or tassels. The bodice was held in place at the top with a pin (agrafe) covered by a bow (parfait-contentement). The ceter was left open to show a vestee. The robe had short split sleeves and was richly decorated. So after reading this and scrutinising all polonaises in the 'Galerie' that I could find, I'm surmising that none of them were draped up anglaises with a fitted back but had the pleated jacket style backs. Polonaise was not the name for the draping but for the style in which the back was cut. Therefore a caraco could be á la polonaise and not be draped at all; while a dress could be either made to be draped, generally called a robe á la polonaise; or be made to be either draped or not, called polonaise á deux fins since it could be used both ways. They all seem to have had curved edges on the sides, and all of them seem to have been worn over petticoats with rather large flounces or borders. First up is the caraco á la polonaise where you can clearly see the back seams, and nothing is draped up. And at last the polonaise á deux fins which apparently was made to be either draped or not, and is shown undraped here. If I hadn't read the description I'd have taken this for an ordinary anglaise that could be draped up, but I don't see the seams in the back so I'll trust Mrs Blum. So, is a polonaise as we know it not really a polonaise? Did some historian at some point assume that because most polonaises were draped, that polonaise refered to the draping and not to the style of the cut? The little polonaise that couldn't? I'd love to hear others' thoughts on this! I had never heard someone say that a polonaise was a reference to draping. Granted my costuming experience is very limited, but any time I have heard the term polonaise, I have thought of the examples in the images that you have posted here. That's great, I'm happy to hear some of us found the right term straight away! 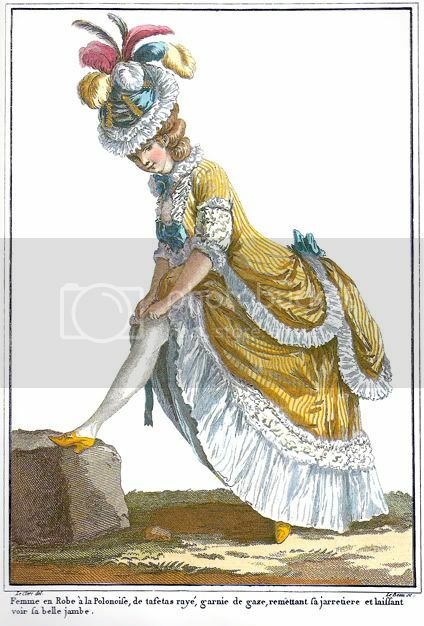 A lot of trusted authors call draped up anglaises á la polonaise, where in fact if this is true, a dress couldn't be an anglaise and a polonaise at the same time. I believe there is a style of polonaise that that has to do with the draping of the skirt and some sort of political statement of the division of Poland. But I think the names are confusing because there were several different kinds of polonaise and variations of it like the robe a la turque. This is exactly what I have always thought too, and I too have given the division of Poland as the reason, but when I we discussed this on the Historical Sewing Forum it seemed that there are no primary sources for this. It's so interesting though - lots of respected authors call a draped anglaise or francaise á la polonaise, but then there's a bunch of other respected authors, and quite a lot of primary sources that point in the direction that the polonaise, just like the anglaise and francaise is its own unique style of dress, to be draped up or not. I'll definatly continue to look into this! To me, polonaiseing is the pulling up & draping of the open side skirt. 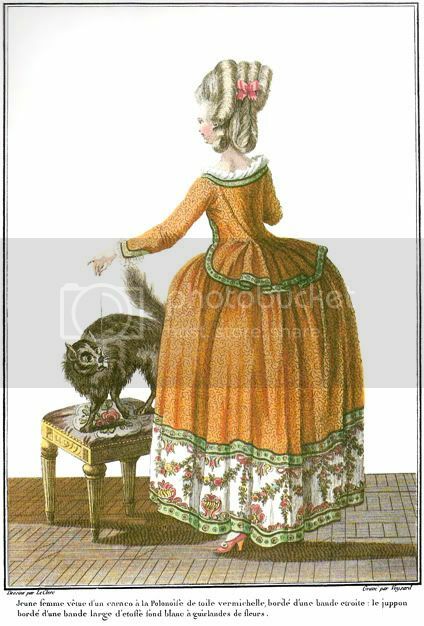 a la Anglaise (the English style) is the style fitted at the waist in the back; a la Francaise (the French style) is the style with long drapes from the shoulders to the ground. I'd look for examples but I think you understand my meaning. This is what I thought too, but now I'm beginning to think that the polonaise is the style of seams and cut of the bodice. And this I think also supports the idea that draping is just draping and might not have a name on its own. It makes sense that the polonaise just like the anglaise and francaise is a syle all its own, which could be draped or not. Thank you again for sharing your findings! It's such an interesting area. Good to see the discussion on polonaises continues! I am so excited that you are seeing a lot of the same things that I have been seeing over the past few years as I have researched this style. I totally agree that it is a distinct and unique style that refers the cut of the bodice front/ back and skirt and not just the looping/draping up of the gown skirt. Having looked at some of the few gowns of this style in person it is even more apparent how different in cut they are from regular anglaise. Just in case you or anyone is interested I most likely will be teaching a workshop next summer through Burnley & Trowbridge in Williamsburg, VA on how to drape, cut and fit a robe or caraco a la polonaise. This will be an advanced class as the cutting and fitting of this are quite difficult due to the extra layers of bodice and different lay of the gown. I have a lot more research/ images on this style than what is currently being shared here or on the forum that I am really excited to present as well at the workshop. Oh, I would so have loved to come to that workshop! Unfortunatly I'm on the other side of the Atlantic pond, but I'm happy that you're spreading the love for this underestimated gown!